This combination craft show and contemporary gallery features a wide range of art, craft and well-designed handmade objects by American artists working in clay, fiber, metal, glass, wood and mixed media. 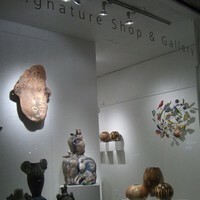 Signature Contemporary Craft also presents exhibitions by well-known and nationally recognized craft artists. Exhibitions of work by a featured artist or group of artists are shown regularly and in conjunction with the work of represented artists that are always available in the gallery. Parking: Lot parking is available.